From 2006 to 2017, about 3 million people spread some 126,000 rumors across the Twittersphere, according to a recent study by Science magazine. The study concluded that false news—journalism characterized by misinformation or hoaxes—reached more people worldwide than did truthful information. On Facebook, fake news ran rampant, too. Indeed, many attributed the 2016 US presidential election results to the false news stories that have made themselves at home on the social networking site, a charge that resulted in Facebook CEO Mark Zuckerberg's recent data-privacy congressional hearings. To ameliorate the growing problem, a number of Silicon Valley players have entered the battle against digital misinformation. Google has allocated a significant amount of funds to support the future of journalism. A media startup accelerator has opted to share its expertise with journalists. And a fleet of VC-backed startups throughout the world has cropped up with the mission of promoting news free of falsities. London-based Factmata has raised about $1 million in backing from investors including Twitter co-founder Biz Stone and Mark Cuban, whom Factmata founder Dhruv Ghulati initially cold-emailed with his business pitch. The two-year-old startup, which is also said to have landed a grant from Google, is developing AI-enabled fact-checking technology to protect against misinformation. Factmata will roll out its journalist-facing platform, as well as one that helps advertisers and businesses avoid placing ads on extremist content, this year. In a conversation with PitchBook, Ghulati said the fake news epidemic is a 10- to 20-year problem that impacts not only the media sector, but the advertising, finance, programmatic trading, public relations markets and more. "The internet was built on free speech," Ghulati said. "That has huge advantages, but that also allows bad players and bad practices that can actually harm democracy and society. Some kind of filter or layer on top of that is needed to give us a sense of what's going on." Factmata wants to be that filter, as do a variety of other startups. NewsGuard, founded by journalists Steven Brill and Gordon Crovitz, raised $6 million in March from Publicis Groupe, Cox Investment Holdings, Fitz Gate Ventures and several individual investors. Launched earlier this year, the company will hire journalists and analysts to review thousands of news and information websites, using green, yellow and red ratings to denote the reliability of news websites. Perhaps unsurprisingly, blockchain startups have also thrown their hat in the ring. With a $5 million investment from blockchain venture production studio ConsenSys, Civil is building out its newsmaking platform. The ethereum blockchain-based business will incentivize collaborative editing and fact-checking to "substantially" limit misinformation across its network. The company recently linked up with the European Journalism Centre and the News Integrity Initiative to create a €600,000 (about $742,000) grant pool for European media organizations. Userfeeds is similarly using the blockchain to incentivize users to honestly rank content based on accuracy. 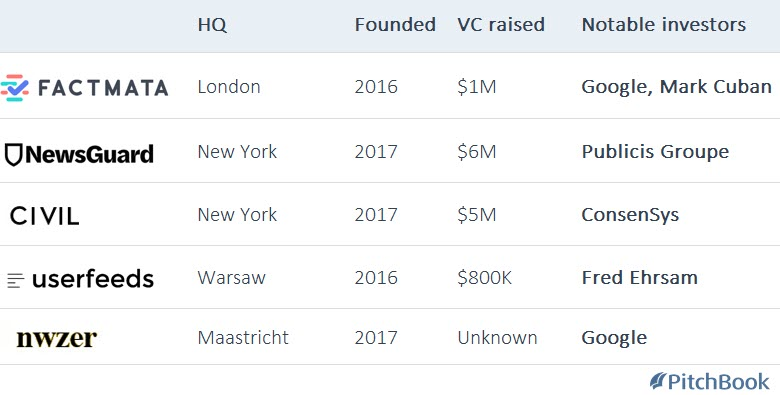 The Warsaw-based startup has raised $800,000 from investors including Fred Ehrsam, the co-founder of cryptocurrency unicorn Coinbase. Another blockchain-powered platform, Nwzer, is creating a user-generated news agency. On its website, the Dutch company claims that by tapping input from citizens, or "peer journalists," it can provider higher quality news content than Bloomberg or Reuters. Greycroft, UTA Ventures, Bertelsmann Digital Media Investments and Social Capital have struck the most deals for US-based media startups since the start of 2017, per the PitchBook Platform. So far this year, VCs have injected nearly $290 million into companies in the sector, including a $22 million round for broadcast news platform Cheddar. A handful of those investors have honed in on the problem of fake news. Google has proven to be one of them, taking a variety of steps to combat threats to the future of journalism. The company's initiatives include a €150 million Digital News Innovation Fund that seeks to support the European news ecosystem; a partnership with the Trust Project to identify credible content online through labels that distinguish between quality journalism and promotional content; and a collaboration with the Society for Professional Journalists to train thousands of local journalists in digital reporting skills. Last month, the search giant also announced the launch of the Google News Initiative, a project to which the company will commit $300 million. The GNI has three objectives: elevate and strengthen journalism, evolve business models to drive sustainable growth, and empower news organizations through technological innovation. NewsLab, a subsidiary of the Google News Initiative, has also established a partnership with Matter, a Silicon Valley media-focused accelerator launched in 2012. Matter typically helps early-stage media entrepreneurs build businesses through its 20-week program, but with the increasing prevalence of false news and recent layoff announcements at renowned newspapers, the accelerator has decided to temporarily expand its offerings to local news reporters. In February, with help from Google, it launched Open Matter, a series of boot camps for journalists working at for-profit news organizations across the US. Led by Matter's director of program, Pete Mortensen, the tuition-free camps are meant to help journalists, designers, technologists and other individuals in the news world build sustainable business models in the age of digital journalism. Matter's first boot camp begins in New York on April 23rd, with more to follow in Missouri, California and Georgia throughout May and June. Mortensen said his history made him a particularly good fit for the initiative. His first job out of college was at a daily newspaper in southwest Michigan that had a circulation of 20,000. Later, he was an editor at a weekly newspaper with a circulation of 4,000. He recognizes the importance of local journalism. "It's such a vital piece of the media landscape," Mortensen told PitchBook. "We need a healthy local news ecosystem in order to even have the potential to have an informed public, which is absolutely vital in having a working democracy." Matter's short, three-day programs may not fix all the issues permeating local news organizations, or put an end to the fake news stories circulating the internet. But for local news reporters, it's a start. Mortensen hopes the workshop will not only inspire its participants to find new ways to start growing their businesses again, but that it will also increase newsroom headcounts. "People are always going to trust a local voice much more. Anything we can do to strengthen that fabric is worth trying," Mortensen said. PitchBook subscribers can access the full dataset on VC investment in US-based media companies.